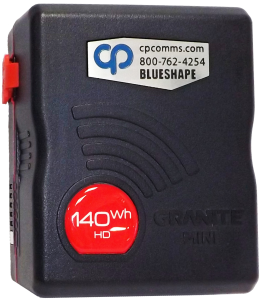 CP Communications has made a large investment in BLUESHAPE Granite Mini batteries for their rental inventory. “After testing the batteries under real world circumstances we have decide to use the BLUESHAPE battery products as our battery of choice moving forward. The low profile and high capacity as well as the charging technologies makes the choice the right one for our technologies and therefore for our clients,” CP Communications CEO Kurt Heitmann says. “The selection of BLUESHAPE batteries and accessories to bear the CP Communications logo is an exciting confirmation of the quality and innovation for the broadcast and image acquisition market. We are pleased to provide the hardware and support services with our US marketing partner, BOLD Distribution of Nashville,” BLUESHAPE Managing Directors and Founders, Pietro Vignali and Enrico Ferretti says.